Discover Bronze Statues and CLEARANCE STATUES with MyGardenGifts.com! Add character to your landscape and make it a haven with statues and sculptures of all sorts. Discover pages of large to life size garden statues with bronze and marble sculptures, fairies, decorative ornaments and gifts like bookends for the office and den. Explore Catholic and Christian catalogs, and memorial sculptures like our Virgin Mary and Jesus statues for churches, bronze children statuary, fountains, welcome statues for your decks and patios and unique gifts for front entrances and more. For those who enjoy the wildlife theme, why not explore our birds, frogs, turtles, lions and even pigs catalogs? And if you are looking for adorable cats and dogs, our catalog celebrates with gift ideas for the home and garden. Email us for more information. Add character highlighting movement, color and character by investing in quality lawn decor like animal statues and children statues. Many of us may like children statuary especially reading statues which deliver innocence to the yard. Some of us may go religious with holy family statues and statues of Jesus and Mary to celebrate the inspirational delight such pieces offer us. Come Christmas, it would be the nativity which will fill the landscape. Regardless of your interests, ornaments offer completeness to the garden imbibing a soul that is uniquely that of the owner's. Our catalogs offer unique decor for the landscape with lanterns and patio lights for your outdoor lighting needs, accents to highlight such as fairies for those who like a little magic and even pineapple finials for those looking to create the theme of hospitality. And if you are investing in sculptures for a memorial or cemetery, why not invest in quality monument angels including weeping angels such as the famous Angel of Grief? 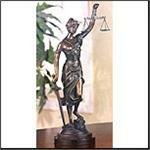 Beautifully detailed, our blind justice statue adds an impressive statement for an office or tabletop. Brass and marble. Our little reading girl is ambitious and determined to browse through her mother's book. Bronze. Door stops and door wedges Add fun to the front door with door stops and door wedges with a unique theme like our Labrador door wedge and decorative door stops such as our cast iron fleur de lis door wedge for the classical home. Celebrate the young graduate student or teacher with unique selection of graduation gifts with our charming children bookends and other bookends which highlight a choice of architectural and decorative bookends for the desk. Celebrate with our mother and child statues and bronze children sculptures for a library or park, tabletop bronze gifts including Buddha and bronze table centerpieces, bronze figurines like our Siamese cat sculptures and large to life size bronze sculptures for an outdoor statement. Visit our bronze statues catalog.